del Hoyo, J., Elliott, A., Sargatal, J., & Baptista, L. (Eds.). (2001). Handbook of the birds of the world, Vol. 6: Mousebirds to hornbills. Barcelona, Spain: Lynx. Forshaw, J. M., & Cooper, W. T. (1985). Kingfishers and related birds: Alcedinidae, Halcyon to Tanysiptera. Sydney, Aus: Lansdowne Editions. Forshaw, J. M., & Cooper, W. T. (1987). 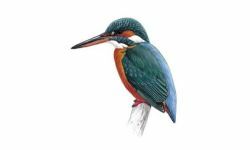 Kingfishers and related birds: Todidae, Momotidae, Meropidae. Sydney, Aus: Lansdowne Editions. Forshaw, J. M., & Cooper, W. T. (1993). Kingfishers and related birds: Leptosmatidae, Coraciidae, Upupidae, Phoeniculidae. Sydney, Aus: Lansdowne Editions. Brazil, M. (2009). Birds of East Asia: China, Taiwan, Korea, Japan, and Russia. Princeton, NJ: Princeton University Press. Coates, B. J. (1985). The birds of Papua New Guinea including the Bismarck Archipelago and Bougainville. Volume 1. Non-Passerines. Alderley, Qld. : Dove Publications. Crossley, R. (2011). The Crossley ID guide: Eastern birds. Princeton, NJ: Princeton University Press. de Schauensee, R. M., & Phelps, W. H. (1978). A guide to the birds of Venezuela. Princeton, NJ: Princeton University Press. Dunn, J. L., Alderfer, J. K., & White, M. (Eds.). (2006). National Geographic field guide to the birds of North America. Washington, DC: National Geographic Society. Flint, V. E., Boehme, R. L., Kostin, Y. V., & Kuznetsov, A. A. (1984). A field guide to birds of the USSR: including Eastern Europe and Central Asia. Princeton, NJ: Princeton University Press. Myers, S. (2009). Birds of Borneo: Brunei, Sabah, Sarawak, and Kalimantan. Princeton, NJ: Princeton University Press. Ridgely, R. S. (1976). A guide to the birds of Panama. Princeton, NJ: Princeton University Press. Ridgely, R. S., & Greenfield, P. J. (2001). The birds of Ecuador. Vol. I: Distribution, status and taxonomy. Ithaca, NY: Cornell University Press. Ridgely, R. S., & Greenfield, P. J. (2001). The birds of Ecuador. Vol. II: Field guide. Ithaca, NY: Cornell University Press. Robson, C. (2002). Birds of Thailand. Princeton, NJ: Princeton University Press. Robson, C., & Allen, R. (2005). Birds of Southeast Asia: Thailand, peninsular Malaysia, Singapore, Vietnam, Cambodia, Laos, Myanmar. Princeton, NJ: Princeton University Press. Sibley, D. A. (2000). The Sibley guide to birds. New York, NY: Alfred A. Knopf. Sibley, D. A. (2001). The Sibley guide to bird life and behavior. New York, NY: Knopf. Sinclair, I., Arlott, N., & Hayman, P. (2011). Birds of southern Africa (4th ed.). Princeton, NJ: Princeton University Press. Sinclair, I., Hockey, P. A. R., Tarboton, W. R., Hayman, P., & Arlott, N. (1995). Illustrated guide to the birds of southern Africa. Princeton, NJ: Princeton University Press. Smythies, B. E., & Cranbrook, G. G.-H. (1981). The birds of Borneo (3rd ed.). Kuala Lumpur, Malaysia: Sabah Society. Stevenson, T., & Fanshawe, J. (2002). Birds of East Africa: Kenya, Tanzania, Uganda, Rwanda, and Burundi. Princeton, NJ: Princeton University Press. Stokes, D. W., & Stokes, L. Q. (2010). The Stokes field guide to the birds of North America. New York, NY: Little, Brown. Williams, J. G., Arlott, N., & Peterson, R. T. (1980). A field guide to the birds of East Africa. London, UK: Collins. Parry, V. A. (1970). Kookaburras. Melbourne, Australia: Lansdowne Press. Warner, D. W. (1952). The green kingfisher. The Wilson Bulletin, 64(3), 131-132. Alden, P., & Gooders, J. (1981). Finding birds around the world. Boston, MA: Houghton Mifflin. Kutac, E. A. (1998). Birder's guide to Texas. Houston, TX: Gulf Publishing. Richardson, C. (1990). The birds of the United Arab Emirates - A guide to the status and distribution of all the species that occur in the UAE. Dubai, UAE: Hobby Publications. Deignan, H. G. (1963). Checklist of the birds of Thailand. Bulletin 226. Washington, DC: Smithsonian Institution.